Why did Jay McInerney once blow up a lavatory? Why does Peter Handke still mourn the passing of Slobodan Milosevic? Why does Michel Houellebecq miss being in a psychiatric hospital? Why doesn’t Wole Soyinka want to visit Australia? And what made Elfriede Jelinek afraid of receiving her Nobel Prize? 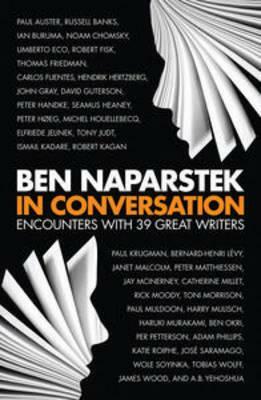 From Ben Naparstek, editor of The Monthly, comes a collection of interviews with 39 of the world’s best writers. In the course of these remarkable encounters, he finds out why - amongst other things - Tony Judt refuses to debate Christopher Hitchens, why Umberto Eco snubbed Stanley Kubrick, why John Malkovich threatened to shoot Robert Fisk, and why James Wood wants to hide behind a pseudonym. In Conversation offers a series of personal and provocative portraits that illuminate what makes great writers tick. Ben Naparstek is best known these days as the 23-year-old wunderkind who was the surprise choice as new editor of The Monthly. But aficionados of the literary interview may have quietly noticed him earlier as a skilful and prolific practitioner of the form, often appearing in The Age’s literary pages and elsewhere. Naparstek shares his guiding strategy in his preface: ‘I always endeavour to maintain a sceptical eye when asking questions of people much more distinguished than myself.’ It’s one that has served him well. Here, 39 of the over 100 interviews he has conducted are collected. It’s an enviable list, too: Paul Auster, Carlos Fuentes, Seamus Heaney, Tobias Wolff, Robert Fisk, Janet Malcolm, Haruki Murakami, Toni Morrison. These are, of their nature, glimpses – snapshots in time. But they’re particularly telling ones: polished, stylish, starkly observant and studded with insights. A fascinating read.